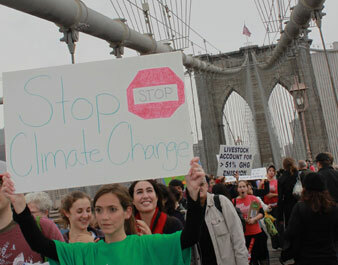 Over 400 activists marched across the Brooklyn Bridge to push action on climate change. While most New Yorkers were just rolling out of their beds on Saturday morning, Timon McPhearson was already at work in the middle of a forest, marking holes in the ground with a can of spray paint. McPhearson, an ecology professor at The New School, was there to plant thousands of cedar, oak and walnut trees in experimental plots, as part of his long-term study to evaluate the environmental effects of a citywide reforestation program called MillionTreesNYC. But on this rainy October day, McPhearson was enjoying an extra influx of twenty workers in addition to his usual volunteer crew coordinated by the Parks Department. The new recruits had signed up as part of the International Climate Day of Action, a daylong, worldwide series of coordinated marches, street performances, plant-ins and other creative forms of citizen action. In an effort to prod international governments to take meaningful action to address the global threat of climate change, McPhearson’s tree planters in the Bronx’s Pelham Bay Park were joined by tens of thousands of other eco-activists staging their own actions around the world, from schoolchildren parading through the streets of Ethiopia to climbers posing for photos on Antarctica’s tallest mountain. The brainchild of author/environmentalist Bill McKibben and his organization 350, the Day of Action was a conceived as an effort to draw awareness to the need to bring the atmosphere’s CO2 concentration back down to 350 parts per million, from its current level of 387. Scientific experts, including NASA climatologist James Hansen, warn that 350 ppm is the highest level the globe can safely maintain. For McPhearson, affiliating his MillionTreesNYC project with the Day of Action was a no-brainer, as one aspect of his research is calculating how much carbon his newly planted trees absorb from the atmosphere. “It’s nice to tie into 350, because we’re all doing this for similar reasons,” he said. In order to have the work resonate with other events occurring around the globe, McPhearson decided to split up his 3,500 saplings into ten groups of 350. At the day’s other hot spots around New York, there were fewer tree saplings and more signs and banners. The two largest local actions were a march across the Brooklyn Bridge organized by Greenpeace, in which participants raised awareness about global warming, and a rally in Times Square in the heart of Manhattan. Jason Blunck, of Brooklyn, joined the bridge marchers because of an announcement he’d seen on the Democracy Now! TV show, which had been publicizing the day of action. Blunck drew inspiration from the thousands of actions taking place around the world–5,200 or more, according to the 350 website–which he hoped would pressure the average American to participate in the climate change movement. “Everybody around the world is reaching out to us, so we should reach back,” Blunck said. The march ended at a park on the Brooklyn side of the bridge, where Greenpeace organizer Eva Erbskorn and explorer Robert Swan–the first man to walk to both the North and South poles–addressed the crowd. Unless the world takes urgent action on climate change and slows the melting of Arctic Sea ice, Swan warned, he might be the only person ever to accomplish that feat. Despite the turnout at the march and the smattering of events around the city, the lack of broader scale participation throughout New York stood in contrast to the engagement of people in other countries around the world–many of whom were in less-developed countries more vulnerable to the effects of global warming. In Ethiopia, most notably, thousands of schoolchildren turned out in the streets; pictures on 350’s web site showed hundreds more demonstrating at numerous events in India, Australia and Canada. The gap in concern was only cemented by a Pew Research Center poll that came out this week showing that 14 percent drop in the number of Americans who believe in global warming since April 2009. By 3:50 pm in Times Square, there were also thousands of people in the streets, but most were shopping, or just on their way by. As most of the day’s actions were winding down in the city, about 150 people had reconvened in the square for a press conference and rally, with large video screens mounted above the crowd cycling through images from Day of Action events around the world. McKibben was on hand to rally the local participants. With the rallies over, the climate change movement still faces an uphill battle to get the planet’s carbon concentration back down to 350 ppm, according to Nigel Purvis, the president of a climate change policy consulting firm and a former State Department negotiator. The current round of climate negotiations, he said, are predicated on older, less imperative science, and therefore “just getting on a track towards 450 would be a major accomplishment in the next couple of years.” Getting on a track towards 350, he continued, is “well beyond what the process is currently contemplating.” Nonetheless, Purvis said, the upcoming summit in Copenhagen is still an opportunity to make “a lot of progress,” and Saturday’s actions represent a grassroots movement that can help bolster politicians as they take the “politically painful positions” required to press forward with a new treaty. Nathaniel HerzNathaniel Herz is a winter 2009-10 Nation intern.